It’s 2013, and I thought I would begin showcasing an amazing doll each Month. What better way to kick off this group of magnificent dolls than highlighting one of my favorites, the incredible “Beautiful Bride Barbie, stock #9599”. The beautiful Bride Barbie #9599 is an unusual doll in so many ways. 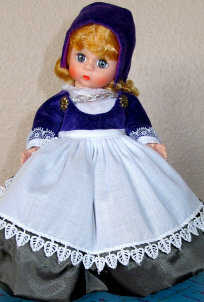 First, she’s from 1976, a year some people would insist is not a true vintage doll. But she was the first bride doll to be released to the public (other than a few very early “dressed dolls” that could be found in the pink silhouette or dressed doll boxes, wearing one of the very early wedding dresses). Her release was very limited and could only be found in a few select department stores. The box is not marked “special” as you will find on the “Ballerina Barbie on Tour” box that was released at the same time and in the same department stores. Second, her unusually gorgeous face makes her unique. She has the twist-n-turn face mold like the 1967 dolls, with real rooted eyelashes. Interestingly, she’s was the first doll that was released in the United States with rooted eyelashes since 1972. She’s on a twist-n-turn bend knee body (marked “Korea”), and only came with blonde hair. Her hair is parted on the side, medium length with a looser style flip. She’s dressed in a lovely white wedding dress, beautiful headpiece, with white closed toe shoes and white single strand pearl necklace. Also included was a garter, and her bridal bouquet with a blue satin ribbon attached. Since this doll is so hard to locate, people often get her confused with the “Beautiful Bride Barbie #9907” from 1978. That doll has a different face mold (superstar face) and painted on eyelashes. But these dolls don’t hold a candle to the exquisite #9599!